Research | Mental Health Association in Essex County, Inc.
Joshua Gordon, director of the National Institute of Mental Health, believes more work must be done on connections between suicidal thoughts and overdoses. As fatal opioid overdoses continue to rise, the causes of each death have become all too familiar: They usually involve a lethal cocktail of heroin, painkillers, and increasingly, the powerful synthetic opioid Fentanyl. But often left out of these tragic stories is the inner turmoil going on inside each victim, and researchers have started examining trauma and depression as well as social connectedness as possible factors in the rise of overdoses. In addition to the spread of painkillers and cheap heroin, some fatal overdoses may in fact be suicides. Dr. Joshua Gordon, the director of the National Institute of Mental Health, believes that there may be a stronger link between the opioid epidemic and suicide than previously realized. Many of the same drivers behind suicidal thinking can be found in those addicted to opioids, from feelings of isolation and despair to economic anxieties and histories of trauma. The Essex County Suicide Prevention Coalition aims to implement community-based suicide awareness, prevention, intervention and recovery programs by providing Evidence-Based and Best Practice training models at low or no cost. QPR stands for Question, Persuade, and Refer — Three simple steps that anyone can learn to help save a life from suicide. Just as people trained in CPR and the Heimlich Maneuver help save thousands of lives each year, people trained in QPR learn how to recognize the warning signs of a suicide crisis and how to question, persuade, and refer someone to help. QPR can be learned in as little as one hour. SafeTALK is a 3 training that prepares anyone over the age of 15 to identify persons with thoughts of suicide and connect them to suicide first aid resources. Most people with thoughts of suicide invite help to stay safe. Alert helpers know how to use these opportunities to support that desire for safety. Powerful video clips illustrate both non-alert and alert responses. Discussion and practice help stimulate learning. Learn steps that contribute to saving lives. ASIST is a two-day intensive, interactive and practice-dominated course designed to help caregivers recognize and review risk, and intervene to prevent the immediate risk of suicide. Professionals, volunteers and informal helpers all need to know how to help persons with thoughts of suicide in ways that increase their suicide safety. Creating Suicide Safety in Schools, or CSSS, is a six-hour workshop for school planning teams that looks at four basic categories of preparedness and additional foundational supports. Often several schools in a district or an area come together to host the training and each sends a planning team. Lifelines is an Evidence-Based, whole-school program made up of three unique components: Prevention, Intervention and Postvention. The Lifelines trilogy is based on over 20 years of suicide-in-youth research that indicates an informed community can help to prevent vulnerable teens from ending their lives. 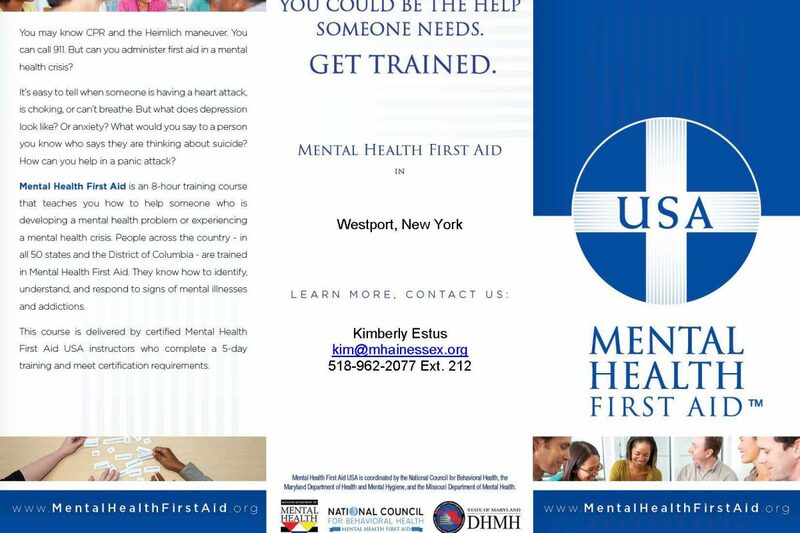 Mental Health First Aid is a public education program that introduces participants to risk factors and warning signs of mental illnesses, builds understanding of their impact, and overviews common supports. This eight-hour course uses role-playing and simulations to demonstrate how to offer initial help in a mental health crisis and connect persons to the appropriate professional, peer, social, and self-help care. The program also teaches the common risk factors and warning signs of specific types of illnesses, like anxiety, depression, substance use, bipolar disorder, and schizophrenia. There are specific programs for Youth, Adults, Public Safety, Rural, Higher Education and Faith Communities. If you aren’t sure which training program is right for you or for a free training consultation, contact Shelby at 518-962-2077 ext. 229. You can also download a list of the available training programs here. 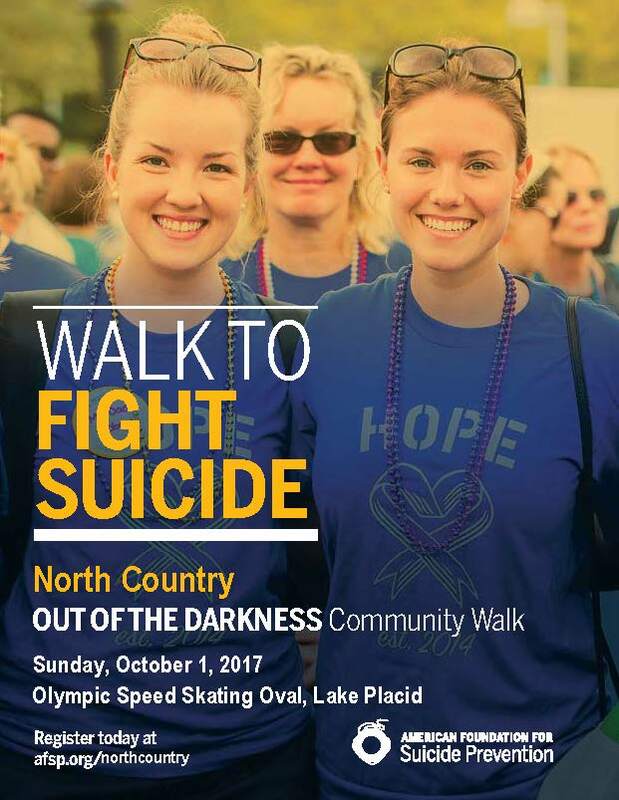 Lake Placid, NY – August 10, 2017 – People from throughout the North Country are expected to participate in the 9th Annual North Country Out of the Darkness Community Walk to Fight Suicide at 1:00 pm, Sunday, October 1, 2017 at the Olympic Speed Skating Oval in Lake Placid. This fundraising walk supports the American Foundation for Suicide Prevention’s local and national programs and its bold goal to reduce the annual rate of suicide 20 percent by 2025. “Suicide affects one in five American families. I am walking to bring awareness to this leading cause of death and let people in the community know that they are not alone. There is help out there for those who live with a mental health condition and support for those who have lost a loved one to suicide,” said Shelby Davis, 2017 North Country Walk Chairperson and member of the Essex County Suicide Prevention Coalition. 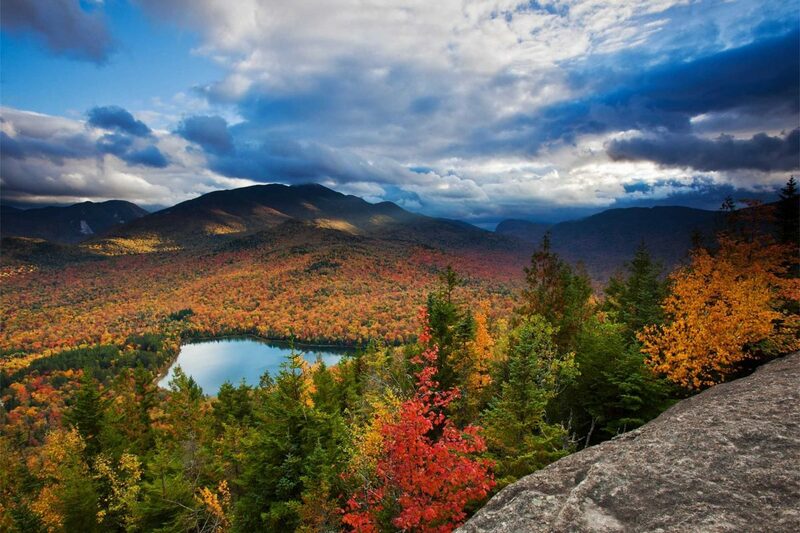 The North Country Walk is part of a national Out of the Darkness walk movement, consisting of Community Walks, Campus Walks and two Overnight walks each year. In 2016, AFSP hosted more than 500 Out of the Darkness Walks spanning all 50 states, uniting more than 240,000 walkers and raising millions for suicide prevention research, education and advocacy. Proceeds from the walks support programs such as Talk Saves Lives™; an educational presentation on how to recognize the risk factors and warning signs of suicide, and a new film entitled It’s Real: College Students and Mental Health that launched this spring. Through fundraising at the walks and other community and national events, AFSP has been able to fund 552 research grants totaling over $34 million dollars since 1987. 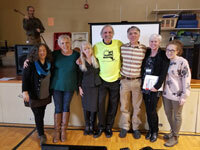 Presented Talk Saves Lives, an introduction to suicide prevention to educate everyone in the community on risk factors, warning signs and how to help to 720 people; and, so much more. “Fifty percent of the funds we raise stay here in the North Country to support programs like these, and the rest goes to research and special projects, like Project 2025. As a survivor of suicide loss, it’s important to me our fundraising dollars stay local; our communities need this support. If you know of any suicide prevention needs in your community, please know the American Foundation for Suicide Prevention and the Essex County Suicide Prevention Coalition is ready and willing to bring programs and services to you at no cost,” said Shelby Davis. Walkers can register at www.afsp.org/northcountry until 12:00 noon on Friday, September 29, 2017, however anyone who would like to participate can register in person at the walk from the time check-in begins until the walk starts. Registration begins at 11:30 am on October 1, Opening Ceremony is at 1:00 pm, and the Walk begins at 1:30 pm and includes a walk around the Oval and Mirror Lake, with the Closing Ceremony at approximately 3:00 pm. The Walk also includes family friendly activities like face painting, a clown, music, Adirondack Bagpipers, basket raffles, silent auction, light refreshments, dove balloon release, team photos, memory board, Lifekeeper Memory Quilts, community resource tables and more. The Walk is seeking sponsors, donations for basket raffles and silent auctions, and volunteers to assist the day of the event. For information about corporate sponsorships or volunteering, call Shelby at 962-2077 ext. 229 or email Shelby@mhainessex.org. Local AFSP sponsors for the North Country Out of the Darkness Community Walk include the Essex County Suicide Prevention Coalition, Citizen Advocates, Adirondack Health, Northern Insuring Agency, Inc., The Wild Center, Whiteface Club & Resort, Mirror Lake Inn, and Ticonderoga Federal Credit Union. The American Foundation for Suicide Prevention is dedicated to saving lives and bringing hope to those affected by suicide. AFSP creates a culture that’s smart about mental health through education and community programs, develops suicide prevention through research and advocacy, and provides support for those affected by suicide. Led by CEO Robert Gebbia and headquartered in New York, and with a public policy office in Washington, D.C., AFSP has local chapters in all 50 states with programs and events nationwide. AFSP celebrates 30 years of service to the suicide prevention movement. Learn more about AFSP in its latest Annual Report, and join the conversation on suicide prevention by following AFSP on Facebook, Twitter, Instagram, and YouTube. It is the mission of the Essex County Suicide Prevention Coalition to work together as a community to increase suicide awareness and prevention. The Coalition envisions Essex County having the necessary information and tools to raise awareness, promote education, and increase action to reduce suicides. Learn more about the Coalition on our website, Facebook and Twitter. The Netflix series 13 Reasons Why, based on the popular 2007 book, has surfaced the topic of suicide prevention across the country. But it has also raised concerns for how young people will react. 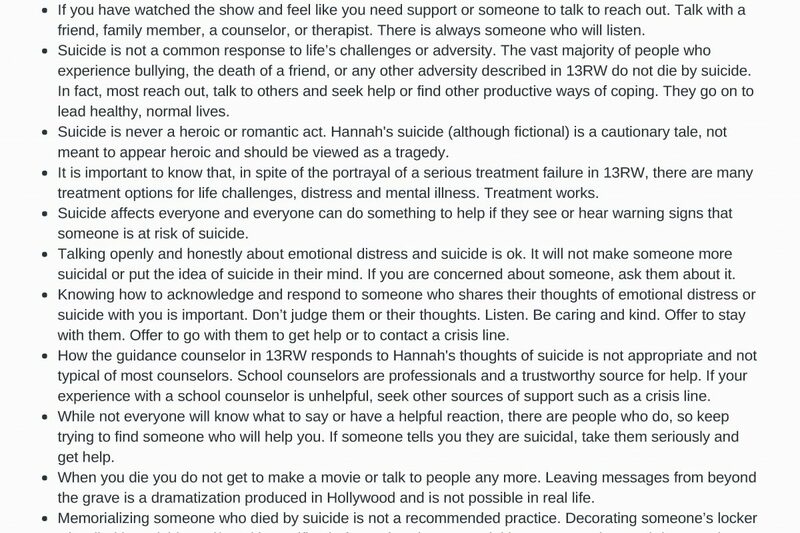 If you’re thinking about the safest and best way to lead a discussion with teens about 13 Reasons Why and suicide, please read the tip sheet co-authored by SAVE.org and the JED Foundation. Click here to download a PDF file of the 13 Reasons Why Talking Points. News from NYAPRS regarding the NYS Budget Deal: Housing, Workforce & Criminal Justice Wins! Despite a turbulent process characterized by frequent fits and stops, a 3-way state budget agreement that was announced by Governor Cuomo last night and that is expected to be approved by both houses of the legislature over the coming days has turned out to be one of the best we’ve seen in a very long time. NYAPRS members have a lot to be proud of! On February 28th, upwards of 700 spirited self and system advocates came to Albany to push for several historic housing and criminal justice initiatives, for long overdue increases to our long underpaid yet dedicated and skilled community workforce, for more community reinvestment dollars from state hospital downsizing and for an innovative pilot featuring a voluntary yet persistent approach to serving people and families in crisis. 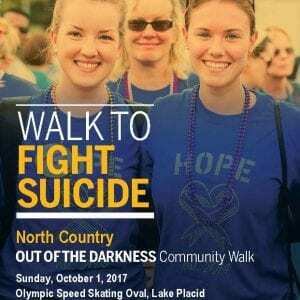 Join us for the North Country Out of the Darkness Community Walk on October 1, 2017 at the Olympic Speed Skating Oval in Lake Placid. Registration/Check in begins at 11:30 am, the Walk begins at 1:00 pm. Proceeds benefit local and national suicide prevention and awareness programs of the American Foundation for Suicide Prevention, including advocacy for public policy, suicide prevention education, and support programs for survivors of suicide loss. Register to walk, be a virtual walker, make a donation, volunteer or become a sponsor at www.afsp.org/northcountry. Contact Shelby at 518-962-2077 or Shelby@mhainessex.org for more information. Visit Mental Health Association in Essex County's profile on Pinterest. the Mental Hygiene Association. Currently, our services are available to adults throughout Essex County recovering from mental illness. Copyright 2017 Mental Health Association of Essex County, Inc.